bordering France and Switzerland. We stayed in the Aosta Valley in the town itself of Aosta. 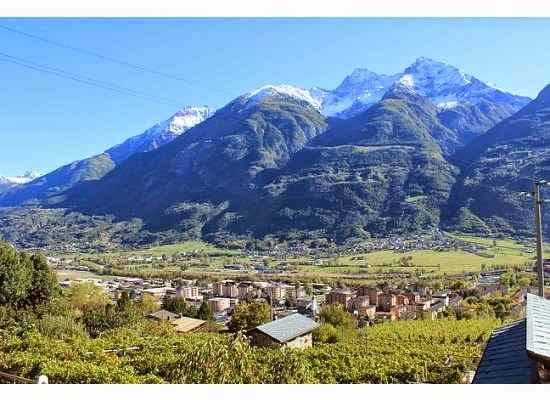 The Aosta Valley is the smallest wine region in Italy and has the highest vineyards in Europe. 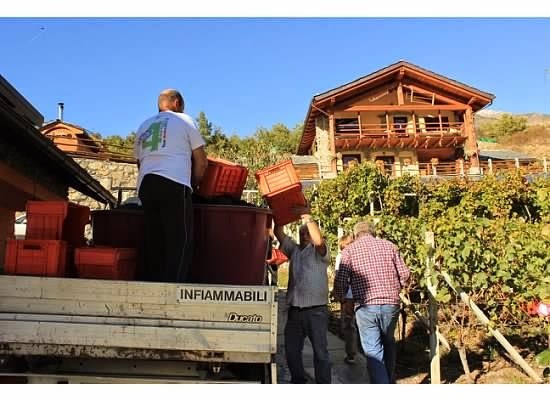 They are all on the steep slopes of the mountain side so therefore they are harvested by hand. You may know this area for the famous mountain, Monte Bianco or Mont Blanc, the tallest mountain in western Europe. I was pleasantly surprised by entering this region just how many vineyards there were. Luckily, the beautiful agriturismo where we were staying, La Viggni de Crest, were harvesting their own grapes upon arrival. There is something special about watching friends & family getting together to harvest their grapes from their hard labor throughout the season. If you're not familiar with what an agriturismo is, it's similar to a B&B, but they are working farmers so they produce a lot of their own crops and live a lot off their own land. They are some of the most beautiful places that I have stayed at in Italy including this one. 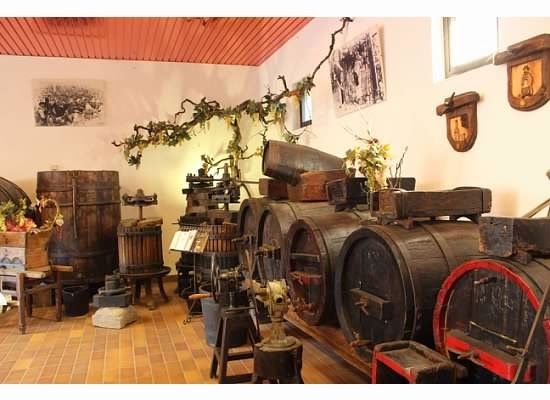 La Viggni de Crest has both apple orchards and vineyards with about 1 hectacre of orchards producing 300 liters of apple juice and 2 hectacres of vineyards producing about 18,000 bottles. The grapes they produce for reds are some that are specific to this area including Fumin for reds, but also Petit Rouge and Gamay, known for being one of the grapes in the Beaujolais wines in France. For whites they produce Chardonnay, Pinot Gris, Traminer (from the Bolzano area of Italy), and Muller Thurgau (a German grape). Our hosts, David and Emanuela Crest, were very hospitable. They sell their grapes, as well as many others do in the area, to a facility, Cave des Onze Communes. 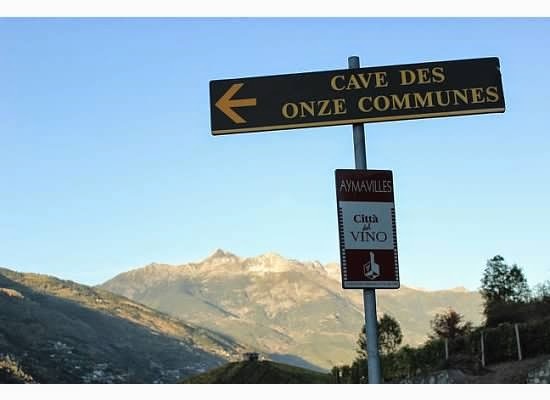 The Cave des Onze Communes is a cooperative winery that takes the grapes from 11 different municipalities and produces the wine. 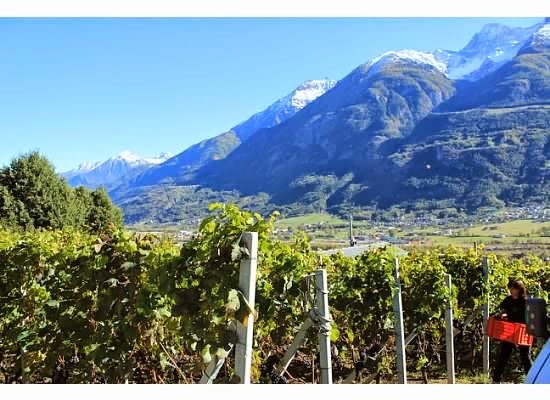 They produce about 400,000 bottles with 19 different DOC wines under the DOC Valle d'Aosta label. I was very impressed by all the whites and reds (and a yummy dessert wine from muscat) including those that indigenous to this area like Mayolet, Petite Arvine and Torrette. Unfortunately they don't sell their specific wines outside this area so I enjoyed them as much as I could while visiting and even took some home to enjoy. I have been to many, many regions of Italy, but this part is a hidden gem that is not well tourist traveled, except for the winter ski season. The wines are great and the surroundings are some of the most peaceful and beautiful I have ever seen.